Hyperion is delighted to introduce the highly sought-after German cellist Alban Gerhardt to the label with these dazzling performances of three cello concertos written within the span of five years either side of the close of the nineteenth century. This disc is a fitting start to Hyperion’s new series of Romantic Cello Concertos; a follow-up to the highly successful Romantic Piano Concerto series and Romantic Violin Concerto series. The Slovak-born Dohnányi grew up with the sound of the cello in his ears—his father was an excellent amateur cellist—and his understanding of instrument shows in his Konzertstück Op 12; its lyricism and emotional urgency suggest an acquaintance with Mahler’s music but there is also more than a hint of Brahms and a splashing of Hungarian folksong. 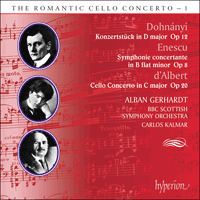 The Symphonie concertante, Op 8 is an astonishingly assured composition produced by the Romanian-born George Enescu in his late teens. The piece is an innovative and virtuosic masterpiece, with luminous orchestral textures. The talented composer was also a fine cellist. D’Albert was born in Glasgow in 1864 into a prestigious family. His ancestors included the composer Domenico Alberti, after whom the Alberti bass takes its name, and his paternal grandfather was an adjutant to Napoleon I. He was taught composition by Arthur Sullivan and his pianistic skills were hailed by none other than Liszt when he went to study with the great master in Vienna. His cello concerto, written in 1899, is unusual in that it opens with the principal theme played by the oboe and then clarinet before finally passing to the soloist. Interestingly all three composers use the single-movement structure subdivided into sections of differing tempi created by Liszt in his symphonic poems. As befits a solo instrument of such vocal quality, long lines of unfolding melody are common to all the works, and all are beautifully ‘sung’ by the soloist accompanied by stalwarts of the concerto repertoire, the BBCSSO, on top form as ever. These three cello concertos, written within the span of five years either side of the close of the nineteenth century, show two composers looking back and one looking forward. All three scores are continuous; the works by the two conservatives, Ernö Dohnányi and Eugen d’Albert, are further linked by their having been composed for the Strasburg-born cellist Hugo Becker (1863–1941), who was a respected teacher at the Hoch Conservatorium in Frankfurt from 1894 and, from 1909 (on the death of Robert Hausmann, cellist of the Joachim Quartet), at the Berlin Hochschule für Musik. Becker was also one of Germany’s most respected chamber musicians, forming a trio with Carl Flesch and Carl Friedberg in Berlin, and he gave trio performances with Busoni and Ysaÿe, Henri Marteau and Dohnányi himself, and with two of the elder statesmen of German music, Joseph Joachim and Hans von Bülow. Ernó Dohnányi (he later Germanized his name, and added an aristocratic particle, as Ernst von Dohnányi) was born in Pozsony (now Bratislava) in 1877 and showed exceptional musicality as a child; his career as one of the leading pianists on the international circuit was launched by a performance of Beethoven’s Fourth Piano Concerto in London in 1898. Three years earlier Brahms had applauded Dohnányi’s Op 1, a piano quintet, and from then on his composing and his performing wrestled for room in his busy life. After teaching at the Berlin Hochschule from 1905, in 1915 he returned to Budapest, where his tireless activity as performer, composer and administrator laid the ground for the generation to follow, chief among them Bartók and Kodály, who would find a genuine Hungarian voice in music. Dohnányi’s own compositions, though, speak the koine of Brahmsian, classicizing Romanticism, as his D major Konzertstück, Op 12, of 1903–4 illustrates. Dohnányi grew up with the sound of the cello in his ears – his father was an excellent amateur cellist – and his writing for the instrument is grateful and assured. In a single, half-hour span of music, the Konzertstück manages to be both an integrated one-movement structure and to hint at the bones of symphonic form. The opening Allegro non troppo begins with a rocking figure in the orchestra and a melodic shape from the cello – four rising crotchets and three rising quavers, much expanded and exploited in the development which follows. The music slips into D minor for a pensive central Adagio, where the rocking figure from the outset often features in the orchestral accompaniment. The cello falls silent for a brief, sudden, tonally restless outburst (quasi-scherzo?) which is reined back equally suddenly, to allow the soloist to emerge with a restatement of the opening material, which is soon invested with an emotional urgency that suggests an acquaintance with Mahler’s music; a brief cadenza brings in an Adagio passage during which the cello muses in rocking arpeggios, and again the opening material returns, Tempo I, ma molto più tranquillo, to lay the piece to rest. The Symphonie concertante is one of a series of astonishingly assured compositions produced by George Enescu in his later teens. Born in Romania in 1881, Enescu began composing when he was five, and music had been flooding out of him ever since, sometimes in scores of some size, his boyhood studies in Vienna and Paris increasing his creative confidence. The compositions from 1895–6, when he was in his mid-teens, indicate the rush in which the inspiration must have come to him: in 1895, he wrote the first two of four ‘school’ or ‘study’ symphonies (as they are known), a cantata, Vision de Saül, and the prologue of another, Ahasvérus, a Tarantelle and a sonata for violin and piano, a Ballade for violin and piano or orchestra and a Tragic Overture; the next year produced two movements of a violin concerto, the Andantino of an orchestral suite, the Third ‘School’ Symphony, a Triumphal Overture, four Divertissements for orchestra, a Fantaisie for piano and orchestra, a piano quintet and an unfinished string quartet. Most of this music remains completely unknown, although recordings of some of the ‘school’ symphonies suggest that, although at this stage Enescu’s mature voice was still only forming, the blend of craftsmanship and sheer spontaneity of invention in these early scores would repay investigation. That mature, individual tone emerged very soon, in the Second Violin Sonata, Op 6, which Enescu composed in April 1899, at the age of seventeen: it shows an absorption of Fauré’s idiom into a musical language altogether more elusive and elliptical. One of the characteristics of the Sonata was to be repeated in the works which followed: a thematic integrity, whereby the opening theme generates the material on which the structure rests. The Octet for Strings, Op 7, would be an astonishing achievement for any composer, let alone an eighteen-year-old: its forty minutes of music, in four contrasted movements, are built on a single theme; the opening statement alone lasts four minutes before it pauses to catch its breath. The Symphonie concertante, completed on 2 November 1901, takes this process further. It is in two expansive sonata-movements linked in one huge span; the first marked Assez lent (‘Quite slow’), with an intervening section, Un peu plus animé, and the second Majestueux. As well as being one of the world’s foremost violinists, a magnificent pianist and, later, a conductor good enough to have been considered as Toscanini’s successor in New York (and he was a respected baritone and organist), Enescu was also a fine cellist, and the solo writing in the Symphonie concertante reveals his complete understanding of the instrument. The cello line emerges from a long-held chord in the winds to spin what seems to be an endless melody: as in the Octet, it is four minutes before the soloist has fully presented the idea, at which point the orchestra picks it up for restatement; only then does the development begin – though it often seems more a rumination on motivic fragments from that opening melody, the cello singing weightlessly over transparent and luminous orchestral textures. In the section marked Un peu plus animé the cello skips virtuosically over diaphanous woodwind lines, which are brought to an abrupt stop. The cello then returns to the autumnal contemplation of material transformed from that big tune, the mood occasionally lightening to allow chuckling woodwind to the fore. Now, after a brief pause, the tune emerges in bold, heraldic outline, against the prominent brass section – and its Romanian origins are clear as never before. The change of atmosphere this statement engenders suggests that the structure is in fact a vestige of four-movement symphonic form, as in the Dohnányi Konzertstück: after the opening Assez lent, the scherzo and a slow movement, we are now audibly in a finale, on the home stretch, and the cello spins off happy tourbillons of notes as it dances towards its goal. A brief, dizzying accompanied cadenza sets off whooping brass and the orchestra brings the piece to an emphatic close. Enescu did think of calling the work a cello concerto (the manuscript solo part bears that designation) but, perhaps recognizing that he had written something very different from the standard showpiece, chose its present title instead – a gift to the critics at its poorly received first performance, when it was labelled a Symphonie déconcertante. With a century of hindsight – during which, inexplicably, cellists have generally ignored it – we can see it as an innovative, and moving, masterpiece. Eugen d’Albert’s background was as colourful as his own life was to prove to be. His ancestors included the composer Domenico Alberti (c1710–46), after whom the Alberti bass takes its name, and his paternal grandfather was an adjutant to Napoleon I. Eugen was born in Glasgow in 1864 and numbered his composer father, Arthur Sullivan and Ebenezer Prout among his early teachers. Like Dohnányi, the young d’Albert attracted praise as a pianist, and in 1881, at the instigation of Hans Richter, he went to Vienna where he met Liszt, travelling to Weimar the next year to study with him; Liszt esteemed d’Albert to be one of his most significant pupils. Although d’Albert the performer was catholic in his taste, with Debussy featuring in his wide repertoire, d’Albert the composer was, again like Dohnányi, a Brahmsian. (The respect was mutual: d’Albert’s performances of Brahms’s music earned the enthusiasm of its creator.) His only cello concerto, in C major, Op 20, written in 1899, opens with a surprise: instead of the soloist announcing the principal theme, it is the oboe which first steps forward to present it, over arpeggios from the cello, followed by the clarinet; only then does the cello itself pick up the melody, the arpeggios now in the orchestra. The woodwinds remain a prominent feature of the orchestration, offering the rhapsodizing cello its partners in dialogue or commentary over the expansive solo part. Veiled horns bring in a Molto tranquillo passage which leads, in a series of cello trills, to the central Andante con moto, in F sharp minor, launched by an arching melody in the strings which is then taken up by the yearning cello. A series of upward runs seeks to animate the music, but it sinks down again, tranquillo, as a passage of pizzicato chords from the soloist initiates a beautifully tender exchange with the flutes. The upward runs make another effort, but the cello gently brings the argument to a close. The Allegro vivace finale breaks out without a pause, the toccata-like writing for the cello again pointed by the woodwind, the flutes bringing the texture a particular brightness. A stormy development based on a decisive Schumannesque figure gives the soloist a few bars’ rest; when the cello resumes, it is with the arpeggios and solo oboe which first launched the work. Ces trois concertos pour violoncelle, écrits dans les cinq années qui précédèrent et qui suivirent le tournant du XIXe siècle, montrent deux compositeurs regardant vers le passé et un vers l’avenir. Cest trois partitions sont continues, mais celles des deux conservateurs, Erno´´ Dohnányi et Eugen d’Albert, ont, en plus, en commun d’avoir été composées pour le même violoncelliste strasbourgeois Hugo Becker (1863–1941), professeur respecté au Hoch Conservatorium de Francfort (à partir de 1894) et à la Hochschule für Musik de Berlin (à partir de 1909, à la mort de Robert Hausmann, violoncelliste du Quatuor Joachim), qui fut aussi l’un des chambristes les plus estimés d’Allemagne – il forma avec Carl Flesch et Carl Friedberg un trio à Berlin, mais joua aussi en trio avec Busoni et Ysaÿe, Henri Marteau et Dohnányi en personne, ainsi qu’avec deux des maîtres anciens de la musique allemande, Joseph Joachim et Hans von Bülow. Né à Pozsony (l’actuelle Bratislava) en 1877, Erno´´ Dohnányi (plus tard, il germanisa son nom, lui ajouta une particule aristocratique et se fit appeler Ernst von Dohnányi) révéla dès l’enfance une musicalité exceptionnelle et vit sa carrière de grand pianiste international lancée par une interprétation du Concerto pour piano no 4 de Beethoven, à Londres, en 1898. Trois ans plus tôt, Brahms avait applaudi son op. 1, un quintette avec piano qui, dans sa vie affairée, marqua le début de la rivalité entre ses activités de compositeur et d’interprète. Après une dizaine d’années consacrées à l’enseignement à la Hochschule de Berlin, il rentra à Budapest en 1915, où interprète, compositeur et administrateur infatigable, il pava la voie à la génération suivante, notamment à Bartók et à Kodály, qui allaient faire entendre une authentique voix musicale hongroise. Les œuvres de Dohnányi parlent, cependant, la koiné du romantisme brahmsien, «classicisant», comme l’illustre son Konzertstück en ré majeur, op. 12 de 1903–4. Dohnányi grandit avec le son du violoncelle – son père était un excellent violoncelliste amateur – et son écriture pour cet instrument est pleine de gratitude et d’assurance. En une seule demi-heure, ce Konzertstück parvient à être une structure intégrée, en un mouvement, mais aussi à insinuer l’essentiel de la forme symphonique. L’Allegro non troppo initial s’ouvre sur une figure cullando à l’orchestre et sur une forme mélodique au violoncelle – quatre noires et trois croches, toutes ascendantes, très dilatées et exploitées dans le mouvement suivant. Puis la musique glisse en ré mineur pour un Adagio central pensif, où la figure cullando du début apparaît souvent dans l’accompagnement orchestral. Le violoncelle se tait le temps d’un bref déchaînement soudain, tonalement agité (quasi-scherzo?) et tout aussi subitement réfréné pour permettre au soliste d’émerger avec une réénonciation du matériau initial, bientôt investi d’une urgence émotionnelle suggérant une certaine connaissance de la musique mahlérienne; une brève cadenza introduit un passage Adagio lors duquel le violoncelle rêvasse au gré d’arpèges berçants; puis le matériau d’ouverture revient, Tempo I, ma molto più tranquillo, pour conclure la pièce. La Symphonie concertante est une de ces compositions, étonnamment assurées, que George Enescu écrivit à la fin de son adolescence. Né en Roumanie en 1881, Enescu commença de composer à l’âge de cinq ans, pour ne plus s’arrêter: jamais la musique ne se tarit en lui, avec des partitions parfois assez conséquentes, les études qu’il mena, enfant, à Vienne et à Paris, n’ayant fait que renforcer sa confiance créatrice. Ses œuvres de 1895–6, composées en pleine adolescence, révèlent avec quelle hâte l’inspiration devait lui venir: en 1895, il écrivit les deux premières de ses quatre symphonies dites «d’école» ou «d’étude», une cantate, Vision de Saül, et le prologue d’une autre, Ahasvérus, une Tarentelle et une sonate pour violon et piano, une Ballade pour violon et piano ou orchestre, ainsi qu’une Ouverture tragique; l’année suivante vit naître deux mouvements d’un concerto pour violon, l’Andantino d’une suite orchestrale, la Symphonie «d’école» no 3, une Ouverture triomphale, quatre Divertissements pour orchestre, une Fantaisie pour piano et orchestre, un quintette avec piano et un quatuor à cordes (également inachevé). Toute cette musique demeure en grande partie inconnue, même si les enregistrements de certaines symphonies «d’école» laissent présager que le mariage entre connaissance du métier et absolue spontanéité de l’invention dont elles témoignent vaudrait d’être étudié – et ce même si ce sont seulement des pages de jeunesse, où la voix de la maturité d’Enescu est encore en pleine formation. Ce ton mature, personnel apparut très vite, dès la Sonate pour violon no 2, op. 6 composée en avril 1899 (Enescu avait alors dix-sept ans), qui montre l’assimilation de l’idiome fauréen dans un langage musical autrement plus évasif et elliptique. L’une des caractéristiques de cette sonate – à savoir l’intégrité thématique – devait ressurgir dans les œuvres postérieures, où le thème d’ouverture génère le matériau fondateur de la structure. L’Octuor à cordes, op. 7 semblerait étonnant chez n’importe qui, alors chez un jeune homme de dix-huit ans: ses quarante minutes de musique, réparties en quatre mouvements contrastés, reposent sur un thème unique; à elle seule, l’énonciation d’ouverture dure quatre minutes avant de s’arrêter pour souffler. La Symphonie concertante, achevée le 2 novembre 1901, développe ce même processus; elle est constituée de deux mouvements de sonate dilatés, réunis en un immense pan et marqués Assez lent pour le premier, avec une section intermédiaire (Un peu plus animé), et Majestueux pour le second. S’il fut l’un des grands violonistes mondiaux, un pianiste magnifique et, plus tard, un chef d’orchestre suffisament doué pour être considéré comme le successeur de Toscanini à New York (sans oublier qu’il était un baryton et un organiste respecté), Enescu fut aussi un bon violoncelliste, et l’écriture solo de sa Symphonie concertante révèle une totale compréhension de cet instrument. La ligne de violoncelle émerge d’un long accord tenu aux vents, pour filer ce qui semble être une mélodie sans fin: comme dans l’Octuor, il faut quatre minutes au soliste pour complètement présenter l’idée, dont l’orchestre s’empare alors pour la réénoncer. C’est seulement après que débute le développement, même s’il ressemble souvent plus à une rumination de fragments motiviques issus de cette mélodie initiale, le violoncelle chantant comme en apesanteur par-dessus des textures orchestrales transparentes, lumineuses. Dans la section marquée Un peu plus animé, le violoncelle effectue des bonds virtuoses sur des lignes diaphanes, aux bois, brutalement interrompues. Puis il retourne à la contemplation automnale du matériau né de la transformation de cet air imposant, le ciel s’éclaircissant parfois pour permettre aux bois gloussants de percer. Passé une courte pause, l’air surgit dans un contour hardi, héraldique, contre la proéminente section des cuivres – là, ses origines roumaines sont plus évidentes que jamais auparavant. Ainsi que le suggère le changement de climat provoqué par cette énonciation, la structure est ici un vestige d’une forme symphonique à quatre mouvements, comme dans le Konzertstück de Dohnányi: après l’Assez lent d’ouverture, le scherzo et un mouvement lent, nous sommes maintenant, clairement, dans une finale, dans la dernière ligne droite, et le violoncelle file de joyeux tourbillons de notes à mesure qu’il danse vers son but. Une cadenza accompagnée, brève et éblouissante, fait crier les cuivres et l’orchestre conclut la pièce avec emphase. Enescu se posa réellement la question de savoir s’il allait intituler cette œuvre «concerto pour violoncelle» (la partie solo du manuscrit porte d’ailleurs cette appellation) mais, sentant peut-être qu’il avait écrit quelque chose de très éloigné du modèle courant, il opta finalement pour Symphonie concertante – une aubaine pour les critiques qui rebaptisèrent Symphonie déconcertante cette pièce mal accueillie à sa création. Avec un siècle de recul – un siècle durant lequel les violoncellistes l’ont généralement, et sans que l’on sache pourquoi, ignorée –, cette œuvre nous apparaît comme un chef-d’œuvre novateur et émouvant. Pittoresque, Eugen d’Albert le fut, dans son histoire familiale comme dans sa vie. L’un de ses ancêtres était en effet le compositeur Domenico Alberti (env. 1710–1746), qui donna son nom à la basse d’Alberti; quant à son grand-père paternel, il était adjudant de Napoléon Ier. Né à Glasgow en 1864, Eugen eut parmi ses premiers professeurs son compositeur de père, mais aussi Arthur Sullivan et Ebenezer Prout. Comme Dohnányi, le jeune d’Albert fut acclamé pour ses talents de pianiste; en 1881, il se rendit à Vienne, à l’instigation de Hans Richter, et rencontra Liszt – avec lequel il ira étudier à Weimar l’année suivante et qui le considérait comme l’un de ses élèves les plus importants. Si d’Albert l’interprète fut éclectique dans ses goûts – Debussy figurait à son vaste répertoire –, d’Albert le compositeur fut, toujours comme Dohnányi, brahmsien. (Le respect entre les deux hommes était mutuel: Brahms fut enthousiasmé par les interprétations que d’Albert donna de sa musique.) Son unique concerto pour violoncelle (en ut majeur, op. 20; écrit en 1899) s’ouvre sur une surprise: ce n’est pas le soliste, mais le hautbois qui s’avance pour présenter le thème principal, par-dessus des arpèges au violoncelle, suivi de la clarinette; c’est alors seulement que le violoncelle recueille la mélodie, avec les arpèges désormais à l’orchestre. Les bois demeurent un élément saillant de l’orchestration, partenaires d’un violoncelle «rhapsodisant», dans un dialogue ou un commentaire par-dessus la partie solo expansive. Les cors voilés introduisent un passage Molto tranquillo, qui débouche, en une série de trilles violoncellistiques, sur l’Andante con moto central, en fa dièse mineur, lancé par une mélodie en arche, aux cordes, reprise ensuite par le violoncelle languissant. Une séquence de passages rapides de notes, ascendants, cherche à animer la musique, qui recommence cependant à sombrer, tranquillo, quand un passage d’accords en pizzicato du soliste initie un échange merveilleusement tendre avec les flûtes. Les passages rapides ascendants font une nouvelle tentative, mais le violoncelle amène doucement l’argument à la conclusion. La finale Allegro vivace éclate sans une pause, l’écriture violoncellistique, de type toccata, étant, ici encore, soulignée par les bois; quant aux flûtes, elles confèrent à la texture un éclat particulier. Un développement tempétueux fondé sur une figure résolue, schumannesque, offre au soliste quelques mesures de répit; quand le violoncelle reprend, c’est avec les arpèges et le hautbois solo, ceux-là mêmes qui lancèrent l’œuvre. Mit diesen drei Cellokonzerten, die innerhalb von fünf Jahren um die Wende zum 20. Jahrhundert herum entstanden, werden zwei Komponisten vorgestellt, die sich an der Vergangenheit orientierten und einer, der in die Zukunft schaute. Alle drei Werke sind einsätzig. Zwischen den Werken der zwei Konservativen, Erno´´ Dohnányi und Eugen d’Albert, gibt es eine weitere Gemeinsamkeit: Sie wurden für den in Straßburg geborenen Cellisten Hugo Becker (1863–1941) komponiert, der ein gesuchter Lehrer war. Von 1894 an wirkte er am Dr. Hochschen Konservatorium in Frankfurt und ab 1909 (nach dem Tod von Robert Hausmann, dem Cellisten des Joachim-Quartetts) an der Kgl. Hochschule für Musik in Berlin. Becker gehörte auch zu den bekanntesten deutschen Kammermusikern. Zusammen mit Carl Flesch und Carl Friedberg gründete er in Berlin ein eigenes Trio, und er führte Trios zusammen mit Busoni und Ysaÿe, sowie mit Henri Marteau und dem genannten Dohnányi, und nicht zuletzt mit Joseph Joachim und Hans von Bülow auf, zwei der gestandenen Repräsentanten deutscher Musik. Erno´´ Dohnányi (er deutschte später seinen Namen ein und fügt die Adelsbezeichnung „von“ hinzu, also Ernst von Dohnányi) wurde 1877 in Pozsony/Preßburg (heute Bratislava) geboren und ließ schon als Kind eine außergewöhnliche Musikalität erkennen. Seine Laufbahn als einer der führenden Pianisten in der internationalen Konzertszene begann 1898 in London mit einer Aufführung von Beethovens 4. Klavierkonzert. Drei Jahre zuvor hatte Brahms Dohnányis op. 1, ein Klavierquintett, gelobt. Seitdem kämpften Dohnányis kompositorische Interessen mit seinen Auftritten als Interpret um Raum in dessen geschäftigem Leben. Ab 1905 unterrichtete Dohnányi an der Berliner Musikhochschule, kehrte aber 1915 wieder nach Budapest zurück, wo sein unermüdlicher Einsatz als Interpret, Komponist und Organisator den Boden für die darauf folgende Generation vorbereitete, allen voran für Bartók und Kodály, die eine authentische ungarische Stimme in Musik finden sollten. Dohnányis eigene Kompositionen sprechen allerdings eine an Brahms geschulte, klassizistisch-romantische Musiksprache, wie sein Konzertstück in D-Dur op. 12 von 1903–04 beweist. Dohnányi wuchs mit dem Celloklang im Ohr auf – sein Vater war ein hervorragender Amateurcellist. Die Cellostimme im Konzertstück ist demzufolge das Werk eines Routiniers und dankbar für den Interpreten. In einem einzigen, halbstündigen musikalischen Bogen gelingt es Dohnányi im Konzertstück, sowohl eine zusammenhängende einsätzige Form zu schaffen als auch den Rahmen einer sinfonischen Form anzudeuten. Das einleitende Allegro non troppo beginnt mit einer wiegenden Geste im Orchester und einer musikalischen Gestalt im Violoncello – vier aufsteigende Viertelnoten und drei aufsteigende Achtel, die in der darauf folgenden Durchführung stark erweitert und beansprucht werden. Die Musik gleitet für den nachdenklichen Mittelteil, Adagio, nach d-Moll. Hier taucht die wiegende Anfangsgeste häufig in der Orchesterbegleitung auf. Das Violoncello schweigt während eines kurzen, unvermittelten, harmonisch ruhelosen Ausbruchs (quasi ein Scherzo? ), der genauso abrupt wieder unter Kontrolle gebracht wird. Der Solist setzt nun mit einer erneuten Darbietung des Anfangsmaterials fort. Diesem Material ist bald ein emotionales Drängen eigen, das eine Bekanntschaft mit Mahlers Musik verrät. Eine kurze Kadenz leitet zu einer Adagio-Passage über, in der das Violoncello in wiegenden Arpeggios träumt. Dann kehrt das Anfangsmaterial wieder zurück, Tempo I, ma molto più tranquillo, um das Stück abzuschließen. Die Symphonie concertante stammt aus einer Reihe erstaunlich versierter Kompositionen, die George Enescu in seinen späten Jugendjahren schrieb. Enescu wurde 1881 in Rumänien geboren und begann im Alter von fünf Jahren zu komponieren. Seitdem floss Musik aus seiner Feder, manchmal in Form beachtlich groß angelegter Werke. Sein kreatives Selbstbewusstsein wurde durch seine musikalischen Unterweisungen in Wien und Prag im Kindesalter noch bestärkt. Die Kompositionen von 1895–96, d.h. aus seinen mittleren Jugendjahren, zeigen die Eile, mit der ihn die Inspiration heimsuchte: 1895 schrieb er die ersten zwei von vier „Schul“- oder „Studien“-Sinfonien (wie sie heißen), die Kantate Vision de Saül, einen Prolog für eine andere Kantate namens Ahasvérus, eine Tarantelle, eine Sonate für Violine und Klavier, eine Ballade für Violine und Klavier oder Orchester, und eine Tragische Ouvertüre. Im nächsten Jahr schuf er zwei Sätze eines Violinkonzertes, das Andantino für eine Orchestersuite, die dritte „Schul“-Sinfonie, eine Triumphierende Ouvertüre, vier Divertissements für Orchester, eine Fantasie für Klavier und Orchester, ein Klavierquintett und ein unvollendetes Streichquartett. Der größte Teil dieser Musik ist bis heute völlig unbekannt. Eine weitere Erkundung würde sich aber sicher lohnen. Man braucht sich nur Aufnahmen von einigen seiner „Schul“-Sinfonien anzuhören. Schon in diesen frühen Partituren erkennt man eine interessante Mischung aus Handwerk und schierer Spontaneität der Einfälle, auch wenn sich Enescus Persönlichkeit zu jenem Zeitpunkt gerade einmal zu bilden begann. Der reife, individuelle Ton entwickelte sich schon sehr früh, wie zum Beispiel in der zweiten Violinsonate op. 6, die Enescu, gerade einmal siebzehnjährig, im April 1899 komponierte. Hier hört man den Einfluss von Fauré auf eine musikalische Sprache, die deutlich ausweichender und elliptischer ist. Eines der Merkmale jener Sonate, nämlich die thematische Einheit, bei der das Anfangsthema das gesamte strukturbildende Material liefert, sollte auch in den folgenden Werken wieder auftauchen. Auf das Streichoktett op. 7 könnte jeder Komponist stolz sein, ganz zu schweigen von einem Achtzehnjährigen. Die 40 Minuten Musik in vier kontrastierenden Sätzen beruhen auf einem einzigen Thema: allein das einleitende Thema zieht sich über vier Minuten hin, bevor es zum Luftholen eine Pause einlegt. Die am 2. November 1901 abgeschlossene Symphonie concertante geht diesbezüglich noch einen Schritt weiter. Sie besteht aus zwei ausgedehnten Sonatensätzen, die zu einem einzigen musikalischen Bogen verbunden sind. Der erste Satz ist mit Assez lent überschrieben und hat einen eingeschobenen Teil Un peu plus animé. Der zweite Satz hat die Überschrift Majestueux. Enescu war nicht nur einer der führenden Violinisten der Welt, ein ausgezeichneter Pianist und später ein Dirigent von ausreichendem Kaliber, dass man ihn als Nachfolger von Toscanini in New York in Erwägung zog (er war auch ein bekannter Bariton und Organist), sondern er war auch ein feiner Cellist. An der Solostimme der Symphonie concertante kann man erkennen, das der Komponist das Instrument durch und durch kannte. Die Violoncellostimme schält sich aus einem lang ausgehaltenen Akkord in den Bläsern heraus und entfaltet eine Melodie, die endlos zu sein scheint: wie im Oktett dauert es vier Minuten, bis der Solist den ganzen musikalischen Gedanken vorgestellt hat. An diesem Punkt übernimmt das Orchester den Faden mit einer Wiederholung dieses Gedankens. Erst dann beginnt die Durchführung – allerdings könnte man glauben, es handle sich hier eher um ein Grübeln über motivische Fragmente aus der einleitenden Melodie. Dabei singt das Violoncello schwerelos über den durchsichtigen und leuchtenden Orchestertexturen. Im Abschnitt mit der Bezeichnung Un peu plus animé springt das Violoncello virtuos über transparente Holzbläserlinien, die zu einem jähen Halt gebracht werden. Das Violoncello widmet sich daraufhin wieder einer reflektierenden Betrachtung über Material, das aus der großen Melodie abgeleitet wurde. Bisweilen hebt sich die Stimmung, wenn die scherzenden Holzbläser in den Vordergrund treten. Auf dem Hintergrund eines gebieterischen Blechbläsersatzes kehrt nach einer kurzen Pause die Hauptmelodie in tapferer, heraldischer Gestalt zurück – und die rumänischen Wurzeln des Werkes treten deutlicher wie nie zuvor zutage. Der durch diese Geste hervorgerufene Stimmungswechsel weist darauf hin, dass hier tatsächlich ein Überbleibsel der viersätzigen sinfonischen Form den strukturellen Rahmen bildet, wie auch in Dohnányis Konzertstück: Nach dem einleitenden Assez lent, dem Scherzo und einem langsamen Satz befinden wir uns nun hörbar in einem Schlusssatz, im Endspurt, und das Violoncello spult seinem Ziel entgegentanzend fröhliche Notenwirbel ab. Eine kurze, schwindelerregende, vom Orchester begleitete Kadenz setzt keuchende Blechbläser in Gang, und das Orchester bringt das Stück zu einem emphatischen Abschluss. Enescu überlegte sich wirklich, ob er das Werk als Cellokonzert bezeichnen sollte (auf dem Manuskript der Solostimme steht tatsächlich diese Bezeichnung), aber er wählte schließlich den oben genannten Titel, vielleicht weil er einsah, dass er etwas geschaffen hatte, das sich von dem sonst üblichen Virtuosenstück völlig unterschied. Der Titel erwies sich als ein gefundenes Fressen für die Rezensenten, die das Werk nach der schlecht aufgenommenen Uraufführung in eine Symphonie déconcertante umtauften. Nach einem Jahrhundert, in dem aus unerfindlichen Gründen die meisten Cellisten das Werk ignorierten, können wir nun im Nachhinein das Stück als ein innovatives und bewegendes Meisterwerk wertschätzen. So ungewöhnlich wie Eugen d’Alberts Herkunft sollte sich auch sein eigenes Leben gestalten. Zu seinen Vorfahren gehörte der Komponist Domenico Alberti (ca. 1710–1746), nach dem die Albertibässe benannt wurden, und sein Großvater väterlicherseits war ein Adjutant unter Napoleon I. Eugen wurde 1864 in Glasgow geboren. Zu seinen ersten Kompositionslehrern zählten sein komponierender Vater, Arthur Sullivan und Ebenezer Prout. Wie Dohnányi schuf sich auch der junge d’Albert vorerst einen Namen als Pianist. 1881 ging er auf Anregung von Hans Richter nach Wien, wo er Liszt traf. D’Albert reiste dann im Jahr darauf nach Weimar, um bei Liszt zu studieren. Der wiederum zählte d’Albert zu einem seiner bedeutendsten Schüler. Zwar war der Geschmack des Interpreten d’Albert, wenn man sein weites Repertoire zur Kenntnis nimmt, sehr vielseitig, spielte er doch auch Debussy. Was dagegen d’Albert den Komponisten angeht, gehörte er wie Dohnányi zu den Anhängern von Brahms. (Die Achtung war gegenseitig: d’Alberts Aufführungen von Brahms’ Musik ernteten dem Interpreten den Beifall des Komponisten.) D’Alberts einziges Cellokonzert, in C-Dur op. 20, wurde 1899 komponiert und beginnt mit einer Überraschung: Hier stellt nicht der Solist das Hauptthema vor, sondern die Oboe. Sie tritt zuerst in den Vordergrund und präsentiert das Thema über Arpeggios des Violoncellos. Ihr schließt sich die Klarinette an. Erst dann übernimmt das Violoncello die Melodie, wobei die Arpeggios nun im Orchester erklingen. Die Holzbläser bleiben ein auffälliges Merkmal der Orchestrierung. Sie sind dem rhapsodischen Cello ein Gesprächspartner oder liefern Kommentare über die ausführliche Solostimme. Kaschierte Hornklänge leiten eine Molto tranquillo-Passage ein, die über eine Reihe von Violoncellotrillern zum Mittelabschnitt in fis-Moll, Andante con moto, führt, der von einer bogenförmigen Melodie in den Streichern eröffnet wird, die dann das sehnsuchtsvolle Cello übernimmt. Eine Reihe von aufwärts gerichteten Läufen versucht, die Musik zu beleben. Aber die Stimmung erschlafft wieder, tranquillo, bis eine Passage, in der der Solist Akkorde pizzicato spielt, einen wunderbar sanften Dialog mit den Flöten einleitet. Noch einmal versuchen die aufwärts gerichteten Läufe ihr Glück, aber das Violoncello wickelt das Argument sanft ab. Der Schlussabschnitt, Allegro vivace, bricht ohne eine Pause aus. Die toccataartige Cellostimme wird wiederum von den Holzbläsern geschärft, wobei die Flöten der musikalischen Textur eine besondere Helligkeit verleihen. Eine stürmische Durchführung, die auf einer eindeutig nach Schumann klingenden musikalischen Figur beruht, erlaubt dem Solisten ein paar Takte Pause. Wenn das Violoncello wieder einsetzt, geschieht es zusammen mit den Arpeggios und der Solooboe, die das Werk begonnen hatten.